Curly’s in Lackawanna is a restaurant and a banquet center. It’s also American and Caribbean. 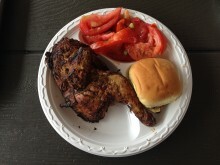 Oh, and they have grill food. It’s kind of confusing, but somehow it works. The tables have fancy tablecloths and likely because of this we got some delicious bread to start off our meal. I flipped through the pages from the grill food to the fancier banquet food and because of some things I heard, decided to go with the grill. There’s are few things more American than good BBQ, and when I came back from a night in Canada to figuratively kiss the ground of the land of the free, the first thing I did was head to Smoke on the Water in Tonawanda. Situated on Ellicott Creek by the Erie Canal, the place looks more like a bar than BBQ, but the menu tells a different story. Filled with things you would expect from a BBQ joint, plus some things you wouldn’t. Buffalo is not a new city. In fact, it’s so old that they have a place called Ulrich’s 1868 Tavern. The 1868 means it first opened in 1868, you know, three years after the Civil War concluded and the first year of the Meiji Restoration. So the place is old, and despite some recent renovations, Ulrich’s definitely maintains the old world charm that makes it easy to picture old shipmen in the 1800s hanging out with Buffalo wenches.